I appeal to all who cherish nature and the protection of wildlife wherever it is. That is why I must alert the world to the horrific and deliberate destruction by Palestinian Hamas and Islamic Jihad of forests, nature reserves, bee hives, wheat fields, avocado groves and innocent wildlife in southern Israel adjacent to the Gaza Strip security fence. Gaza is suffering not under Israel, but under Hamas occupation which is the Palestinian junior branch of the terrorist Muslim Brotherhood. Israel withdrew fully from Gaza in 2005 hoping that the Palestinian Arabs would create a peaceful society. Predictably and tragically it was not to be for Islam never accepts a non-Muslim nation in territory Muslims once conquered in the name of Allah, even if that nation – Israel – existed for millennia before Islam was created. Hamas has employed fire kites and helium filled balloons, which fly into Israel and explode creating raging firestorms in the fields, meadows, forests and nature reserves. It is a searing tragedy witnessing verdant forests, lovingly planted so long ago in what was desert and wasteland, now turned into blackened stumps. Once clean and fresh air is now filled with choking ash. Wildlife, including deer, turtles and birds, have suffered in the most torturous way, burned alive in the terrible fires that have blackened and ruined over 8,500 acres of land in southern Israel. The costs are in the billions and the hapless Israeli farmers are trying desperately to bring in whatever produce they can salvage. The destruction is monstrous. But this is one more chapter in the 1,400 years of brutality, ruin and violent destruction that epitomizes the ideology of Islam, of its followers, and of its book, the Koran, which devotes some 61% of its instructions to killing non-Muslims – or those which it arrogantly and pejoratively calls infidels. But where is the outrage from all the world's environmental groups and from PETA? Their silence is deafening and reeks of hypocrisy and stark indifference to the destruction of wildlife and restored agriculture that generations of Israeli pioneers, farmers and ecologists have painstakingly redeemed from the desert and wilderness. The embattled Israeli villagers and farmers are plagued now by the foul smell of burning vegetation and woodland with the commensurate polluted air quality which is hospitalizing many with asthmatic and respiratory health issues including bronchitis and pneumonia. Thousands of missiles and mortars have rained down upon southern Israel's villages and towns from Gaza since Israel withdrew fully from the Gaza Strip in 2005. Now Hamas and Islamic Jihad thugs have sunk to yet a new low by tying incendiary material to a falcon and sending it into Israel, thus marking a new evil in the terror group's catalog of crimes against Israel. Gilad Gabai, a National Parks Authority ranger, discovered the bird on Monday with the flammable material tied to the hapless bird's tail. The bird was dead after being burned alive in the fire it had ignited. Gabai told Israel Radio on Tuesday that "animals are already being burned as a result of the fire kite and balloon terrorism. Now we see that they [Hamas] have moved on to using animals as a weapon. This is very distressing. Apparently it's not enough to destroy nature with fire kites, now birds are being used for arson and terror as well." The use of innocent and abused animals is not new to Palestinian terrorism. Donkeys with bombs strapped to them have been used in the past by the terrorist Palestinian organizations to kill and maim human victims. In Islam, dogs are considered unclean. 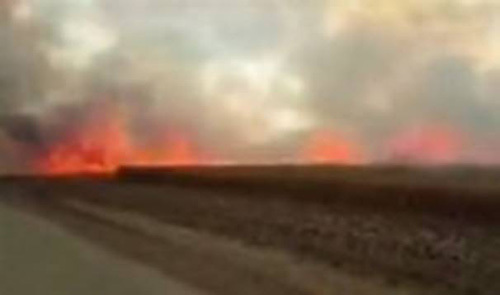 The burning kites and balloons launched by Hamas and Islamic Jihad over the security fence have ignited over 1,000 fires in southern Israel adjacent to the Strip in the past three months, laying waste to more than 8,500 acres of forest, agricultural land and several nature reserves, with damage totaling tens of millions of dollars. This is catastrophic in a country like Israel which is only the size of New Jersey. The Gaza-based arson terrorists ignited 24 fires in Israel's south on one day alone. I do so earnestly hope that you, dear readers, can help condemn this Palestinian crime by forwarding this information far and wide – facts that the liberal and leftwing mainstream news hardly mention at all or, if it does, so often dementedly blames the victim – embattled Israel. By publicly exposing this inhumane vandalism, perpetrated upon nature itself by Palestinian Hamas and Islamic Jihad there will, hopefully, be an outcry that will shame even Hamas and put an end to this monstrous crime being perpetrated by the overwhelmingly Muslim Arabs who call themselves Palestinians. These same Arabs demand a state to be called Palestine, but it would be one which has never existed as a sovereign nation in all of recorded history. The geographical entity called Palestine has merely been a territory occupied over the centuries by alien conquerors who had no ancestral roots in the Land, unlike the Jewish native population whose Biblical and post-Biblical ancestry spans nearly 4,000 years of continuous history. And even during the loss of sovereignty in the Land, the Jews nevertheless always maintained whatever numbers they could sustain under often hostile alien rule until Israel was again reconstituted as a state in its ancient and ancestral homeland. Please also help expose the silence of organizations devoted to protecting the environment and wildlife such as The Sierra Club, World Wild Life Fund and PETA, to name a few, yet who remain mysteriously unwilling to fully censure Hamas in the face of Palestinian destruction of innocent wildlife and of what was a green and pleasant land.